What can I gain from BJJ? Ricardo de la Riva is among the handful of people whose name has been immortalised within the BJJ lexicon. He was not the first grappler to wrap his leg around his opponent’s lower limbs, but he became synonymous with that hook. In one of Can’s earliest interviews for JJS, he spoke to de la Riva during a visit by the famous guard player at Nick Brooks’ school in Mill Hill. ARTEMIS BJJ: You are famous for the de la Riva guard. I’ve read Carlson himself often referred to it as the ‘jello guard’, so did any of that come from a pre-existing guard you learned from Carlson, or was it something you largely developed yourself? RICARDO DE LA RIVA: Carlson’s team was very much focused on passing the guard, so the guard passing aspect was strong: that had a huge influence on my game. I’m very flexible, I’ve always been very flexible. So, everyone wanted to pass my guard. Since I was a blue belt, I gave the higher grades a hard time because of my flexibility and effective use of the guard. Carlson was always watching over me, supporting me, giving me tips on how to perfect my guard. ARTEMIS BJJ: I’ve also read you have particularly flexible ankles: was that also helpful? RICARDO DE LA RIVA: Yes, my toes, feet, knees. A few years back, I could easily put my foot behind my head with no problem. Very flexible and thankfully injury free. ARTEMIS BJJ: Do you think it is more important for a beginning student to develop a solid closed guard, or should they have a good understanding of open guard early on? RICARDO DE LA RIVA:Teaching is very simple. Teach the hard stuff first, so let’s teach open guard first. That’s how I do it at my academy. If the student is comfortable using open guard, when they progress to closed guard, they’re not going to want to use closed guard, because it’s not as interesting as open guard. Even if the opponent passes their guard, at least the student is trying to play an open game. ARTEMIS BJJ: You started your training with Marcus Soares. How would you compare his style of teaching to Carlson? 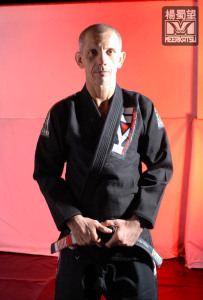 RICARDO DE LA RIVA: Marcus Soares was a brown belt at the time, under Carlson. I was training with Marcus at his home, upstairs. But because Marcus wasn’t affiliated to anybody, I couldn’t compete under him. So, I had to move to Carlson, where I won a competition, from yellow belt to blue belt, under Carlson. However, the teaching style was very similar, because Marcus was a student of Carlson. So it was a natural progression. There was no difference in the teaching style. We were both students, Marcus and me, under Carlson. ARTEMIS BJJ: Do you have any favourite memories training with the legendary Carlson competition team during its heyday? RICARDO DE LA RIVA: Every day, you had to kill the lion, because the training was very very hard, very tense. But it was healthy, it wasn’t a sacrifice by any means. You’re looking after the body, after the mind. It was fun, it wasn’t a chore to go train jiu jitsu, although it was hard. After the fight, you wouldn’t stay still: at most martial arts, you’re expected to stand still. You would socialise with friends, crack a joke, talk about what happened at the weekend. It was a joy, a pleasure, despite the hard work. I never missed a session. I went to university, but I carried on through my degree, regardless of exams or illnesses. ARTEMIS BJJ: What was it like to teach at the Carlson academy during the ’80s? RICARDO DE LA RIVA: As a blue belt, I used to help with teaching girls and children, until I was awarded my purple belt. Then I could teach the whole class by myself. I developed my teaching style by looking at Carlson, who was a big, strong, hard guy, but with a huge heart. I would see the children running around him and hugging him, but at the same time you see this figure who looks very scary. However, he was captivating, he was someone very charismatic. That’s the same approach I was developing. If my instructor is like this, strong and hard with a mean look, but at the same time very welcoming, very warm, that’s my style. ARTEMIS BJJ: Having taught that early on, do you think it is generally a good thing for blue belts and purple belts to be teaching and heading up schools, or should it always be a black belt? 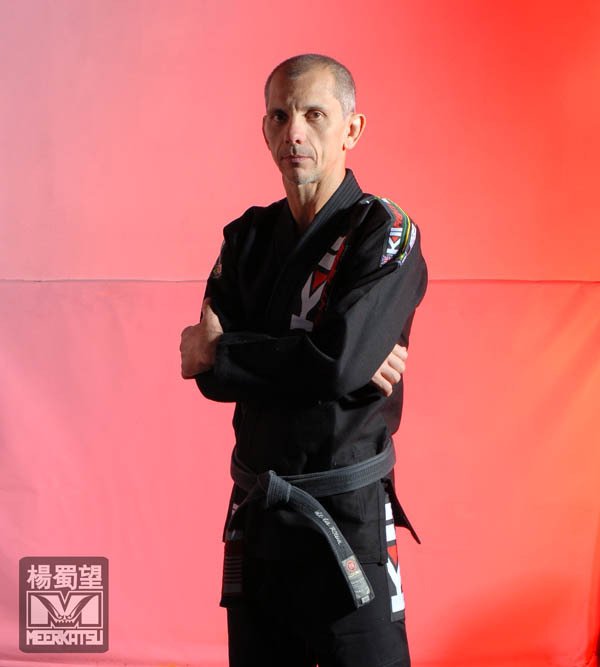 RICARDO DE LA RIVA: As long as you have support from a black belt. You should encourage, by all means, a purple belt to start learning how to teach, how to pass on the knowledge from the black belt. Sometimes you find a white belt who wants to be a jiu jitsu instructor. So why not give them the opportunity? You pass on the responsibility to a blue belt, to help out the white belt. It is almost like a monitor at university. You have those monitors at university who give you a hand – you know, PhD students. You give lectures, so you get a PhD student to deliver the class. I’m an example of this. At university, I used to help my lecturers out with the running. I graduated in sports science, so I was always helping my lecturers in that sense. If you have somebody looking over you, knowing you can rely upon them if you need to, why not? ARTEMIS BJJ: Do you have any thoughts on more recent developments in BJJ competition, like the fifty/fifty guard, or is it no different than when other guards first emerged, like spider guard or your own de la Riva guard? RICARDO DE LA RIVA: What has changed in this position is that when you sweep the guy, in a fifty/fifty, you lock a triangle on his legs. What I used to do was sweep the guy, but without locking off the triangle, so the guard was still open. It is a very handy position. The new thing about the fifty/fifty is that you have this variation, which is effective, of locking the triangle. It is like the spider guard. Before, you used to control the sleeve, putting your foot on the bicep. Later on, the foot went under the armpit. So it is the same principle, the same variation. Just a detail has changed in the position. That’s what is wonderful about jiu jitsu: it is always evolving, always progressing. New things are being taught. You have a position, so many practitioners, different bodies, different sizes. So you have to adapt the position. It is always evolving, always changing. The evolution of jiu jitsu is continuous. ARTEMIS BJJ: So is that something you work on in your own game, incorporating these new developments, or do you stick with tried and tested techniques you’ve used for years? RICARDO DE LA RIVA: Of course: I adapt, I welcome these changes. I prefer to start off with the de la Riva hook and then go to the fifty/fifty position. So yes, I do incorporate it into my own game. You are adding on to your own game, you are adding on to your arsenal of choices. It is not simply just changing one for the other, my game to the fifty/fifty. It is embedding the fifty/fifty onto my own game, making it richer.